Hand crushed Dauphiné green walnuts, harvested at Saint-Jean, muscade and cinnamon lend this aperitif its spicy and fruity flavours. Gentian roots, infused directly after harvest, result in the refined bitterness, so appreciated by enthusiasts, and the tonic properties of this drink that open up the appetite. With its sweet and bitter taste, flavour and candied oranges and honey, Orange Colombo lingers on the palate and provides the ideal base for several cocktails. 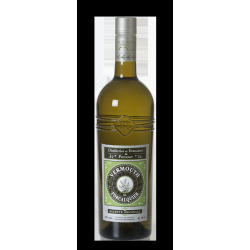 Vermouth de Forcalquier is an aromatized wine made with absinthe and vivacious, bitter plants and spices (lemon balm, mint, mugwort, green aniseed, cinnamon, coriander and pink peppercorns). Vermouth de Forcalquier is a full-flavoured aperitif in a superb vintage style bottle. 1 RinQuinQuin 10 cl, 1 Orange Colombo 10 cl, 1 Noix de la St Jean 10 cl, and 1 Gentiane de Lure 10 cl. 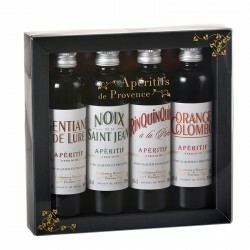 Provencal Aperitifs, made from a base of either red, white or rosé wine, get their unique flavour from the addition of infusions made from plants, roots, fruit or zest and a little sugar. Some pure alcohol can also be added. They lend themselves perfectly to making deliciously fruity cocktails. With the spicy and fruity aromas of its red wine coupled with an infusion of walnut shells, Noix de la St Jean is a full-flavoured aperitif with lots of character. It pairs well with mature cheeses such a raw milk Queyras Blue, a slice of melon, or walnut based desserts. This intensely flavoured aperitif is one of the oldest recipes of Distilleries & Domaines de Provence. Its power and touch of bright bitterness, derived from citrus zest, infusions of gentian root and cinchona mixed with white wine from the Luberon, will delight the most demanding of connoisseurs. Orange Colombo, a bittersweet association of rosé wine and infusions of orange, offers fragrant aromas of orange and citrus fruit that will harmonize perfectly with chocolate desserts and fresh fruit salads. It has a deliciously refreshing quality that makes it ideal for summer aperitifs. A veritable explosion of flavours in the mouth, thanks to its aromatic blend of absinthe, gentian, lemon balm, mint, mugwort, aniseed, cinnamon, coriander and pink peppercorns. A must try!